After several months of tweaking and testing, we’re excited to introduce Ideas. This new, fresh from the oven addition joins Questions and Polls as the third main Slido feature. Ideas will help you collect and curate ideas with your team members or meeting participants. You can let people upvote the suggestions to uncover the most popular ones, display them on a screen and export the data afterward. To give you some inspiration, here are six ways Ideas can help you run productive brainstorming sessions. Leverage your team’s knowledge to set up new projects. Ask your colleagues to submit their project proposals or improvement suggestions for the next quarter. Identify the most popular suggestions by letting people vote for the ones they want to support. Tip: Ask people to put their name down to help you identify potential project owners. Which projects should we prioritize in the next quarter? Which areas of business can we improve over the summer? Boost the impact of your internal training. To make your learning sessions on point, get people to send in topics they want to learn about in advance. Then run the learning sessions based on the top voted ones. What would you like to learn at the next company training? What topics would you like to cover during the learning session? Ensure your meeting covers the most important areas. To check you’re not missing the mark, gather the discussion items in advance. You can prioritize the collected suggestions by asking the participants to vote for the most burning ones. 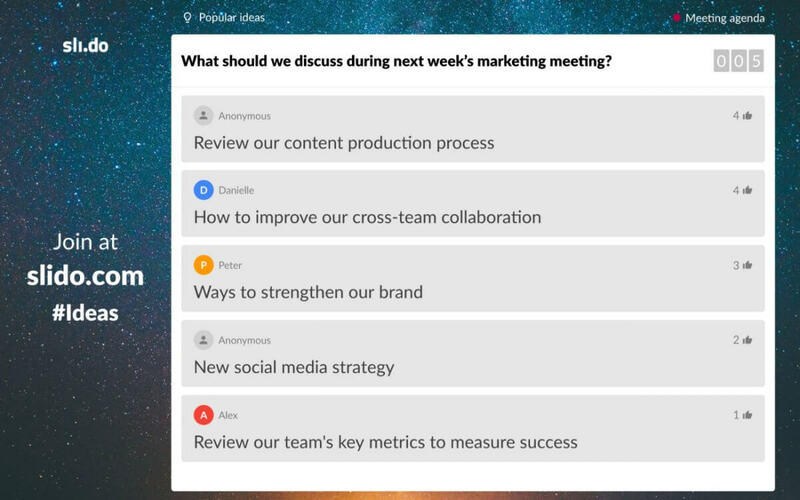 Which topics should we discuss during the product meeting? What should we discuss during next week’s marketing workshop? Use insights from your customer support, sales reps or other teams to shape the product roadmap. Invite them to submit new feature or improvement ideas. Their perspectives on the product can help you uncover solutions you might have missed before. Which project would we be foolish not to do in the next quarter? Which features should we definitely work on in the next three months? Involve your team members in the goal-setting process. Ask what they think the objectives for the coming year should be. It is easier to understand, identify with and commit to new team goals if you have a role in creating them. 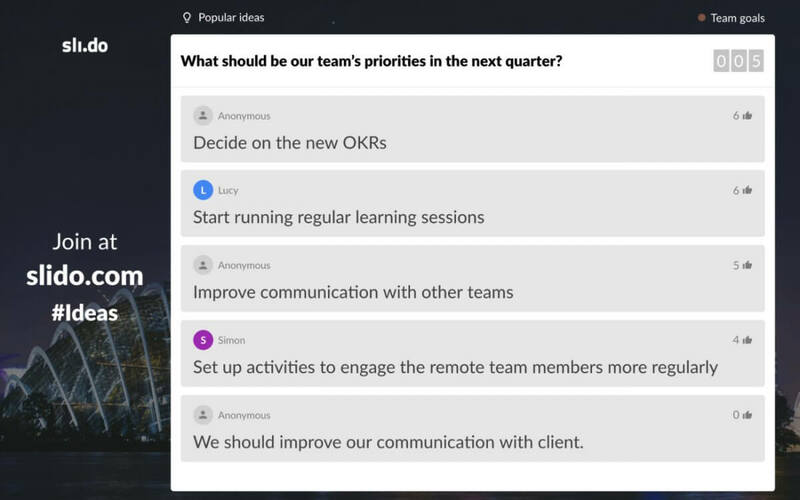 What should be our team’s priorities in the next quarter? What are the hottest areas we should focus on in the coming year? Get your team members to review how they work. Invite people to send in their biggest challenges and upvote all the other submissions that apply to them. Evaluate them together to find the right solutions. What was your biggest challenge in the last month? Is there anything that made your work difficult in the past week? There are countless other ways and contexts in which you can collect suggestions with Ideas, so let your imagination soar. Use it as a fun icebreaker or to gather views on operational or logistical issues during your all-hands or offsites. What should be our next offsite destination? What do we need to start doing to build the culture we want? Which snack would you like to see in our selection? Which tunes should we dance to during our Christmas party? Try Ideas during your next brainstorming session.